Home Procurement News Can healthy fast food fight obesity? As much as people strive to be healthy, they aren't always as good as they want to be. When they're on the go or in a rush, they don't have time to make nutritious, home-cooked meals. Instead, consumers turn to quick and easy options, such as fast food. Cheeseburgers, chicken nuggets and french fries are staples in any busy person's diet, but they aren't always as good as they look in advertisements. However, that doesn't stop many people from going through the drive-thru on their way from point A to point B. Unfortunately, these meals usually aren't healthy, and are full of calories, fat, sugar and salt. This isn't beneficial for anyone, especially when there is an obesity problem in the U.S. However, one state is trying to change that by proposing a law that would set guidelines for children's combo meals at fast-food restaurants and improve nutrition throughout the supply chain. In 2014, Benjamin Kallos, a New York City council member, proposed the "Healthy Happy Meals" bill to reduce the amount of fat, calories and salt children consume through their child-sized meals, CBS News reported. Any meals geared toward children would need to meet certain provisions to ensure that young diners aren't eating overly unhealthy foods. These combo meals would need to be fewer than 500 calories and contain less than 35 percent of calories from fat, less than 10 percent from saturated fats and less than 10 percent from added sugar. Child-size meals would also be required to have fewer than 600 milligrams of sodium and at least one serving of fruits, vegetables or whole grains. This is a step in the right direction, considering 17 percent of children and teens are significantly overweight, according to the U.S. Centers for Disease Control and Prevention. More than 8 percent of children aged 2 to 5, nearly 18 percent of kids aged 6 to 11 and 20.5 percent of 12 to 19 years old are obese. While fast food isn't the sole cause of the condition, it does contribute to the severity of obesity. These meals are high in salt, fat, carbohydrates and sugar. These can all lead to diabetes, high levels of bad cholesterol, heart disease, asthma and poor dental health, Healthline explained. Exposing children to these additives early in life increases their risk of chronic health conditions as they age. If the proposed standards are met for children's meals, kids would eat 9 percent fewer calories and 10 percent fewer salts and fats, according to researchers from the New York University Langone Medical Center. Starting at the beginning of the supply chain, food manufacturers would need to alter their production and procurement methods. They would need healthier options to choose from, just as their customers require the same choice. Unfortunately, this change may not be as easy as it seems. 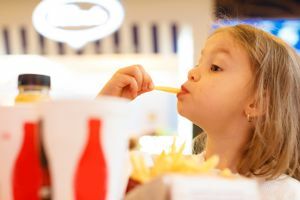 Researchers found that children consume an average of 600 calories in their fast food meals, and only 35 percent of those surveyed actually ate child-sized meals. Nearly all of those kids' meals did not meet the proposed criteria. It may be harder to ensure young diners eat nutritiously if they aren't ordering combo meals for children. "We're at a point where we have to move the needle and we have to do it with policies like this," said Marie Bragg, an assistant professor at NYU and the study's senior author. Implementing changes to child combo meals is just the start of creating a healthier society. By improving manufacturing and providing more nutritious options for everyone, fast-food restaurants could help lower the obesity rate.